It is common knowledge that today we are not living in a contented, just and conflict free world. Globalization and related processes have integrated countries across the world closer together. Economic, social, cultural and political relations today are as much global as local. Millions of people are on the move, traveling across countries and continents for work, business, education and leisure. Social networks are formed more and more in the cyber world, often at the expense of face to face primary social relations in local communities. Yet, there are no widely shared, collective values and norms that harmonize interpersonal and inter community relations and reduce tensions, cut-throat competition and violent conflict. While human relationships in diverse spheres such as the economy, social structure, culture and politics have spilled over into transnational space, away from social systems hitherto largely contained within a nation state framework, no effective global institutional framework has emerged to moderate or reconcile conflictual relationships in a satisfactory manner. Meanwhile, the same global forces have either weakened existing local institutions or prevented the development of new ones in many countries. We have pursued a growth oriented development path over the last several decades leading to more economic growth in more countries but overall, the result has been greater concentration of wealth both within and across countries. While the owners of capital and technology have moved around the world looking for opportunities to make more money, wealthier classes have also been travelling around the world looking for more and more pleasurable consumption opportunities. Meanwhile, more and more people coming under increasing economic and social pressure have tended to migrate across national borders to find more lucrative work in order to meet the basic needs of their families. In the process, many of them have been subjected to exploitation, violation of their rights and even violence at the hands of their employers. This is the experience of a significant proportion of Sri Lankan workers, particularly women in the Middle East.Yet, many developing country governments faced with increasing foreign debts have not been able to stem the exodus as inward remittances have become a blessing in disguise. On the other hand, continuing out migration of labour has also led to wage pressures and inflation at home with significant social and economic implications. Increasing globalization of economic relations, politics and human social encounters and the convergence of cultural products in multiple spaces across the world have not reduced tensions, misunderstandings and conflicts among people but have only intensified them. People who subscribe to liberal democratic values congregating in such spaces as United Nations, liberal civil society organizations and universities have recognized the new possibilities for adopting collective solutions to pressing problems created by recent developments. But, the same problems have also given rise to popular movements that do not perceive the potential that greater cooperation among communities and countries offers to find collective solutions to common human problems. Nationalist or sectarian political movements and violent ethno-religious campaigns in different parts of the world do not seem to perceive a world where diverse human societies or groups come closer together to share the resources in a cooperative and equitable manner to satisfy diverse human needs. "many developing country governments faced with increasing foreign debts have not been able to stem the exodus as inward remittances have become a blessing in disguise"
So, today, the political contestation in many metropolitan and peripheral countries is among those who advocate global cooperation based on universal human values and democratic principles on the one hand and populist demagogues who mobilize disgruntled marginalized populations based on nationalist rhetoric and divisions in society on the other. While the former argue for the creation of an equitable, harmonious and just world order, the latter are determined to create inward looking, nationalist political regimes that are more than likely to generate conflicts both within and outside their national borders. This is happening at a time when the leaders of a vast majority of countries have given their approval to work together to implement several historic global agreements on sustainable development and climate change in collaboration with global institutions and civil society organizations. 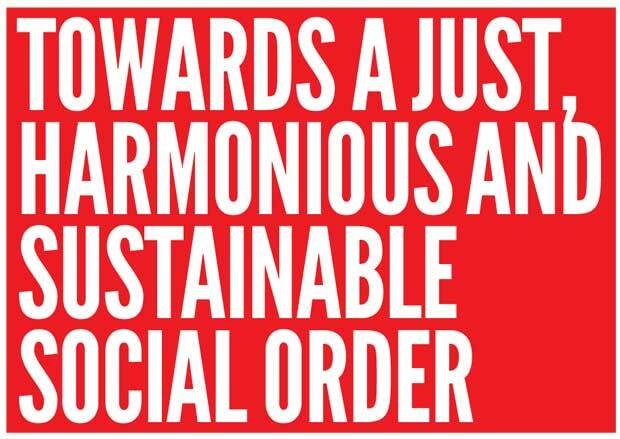 Given the highly inter-connected and inter-dependent nature of the world today, the only option available to us seems to be to work towards a just, equitable, harmonious and sustainable global socio-economic order rather than enter into a period of inter-national conflicts over natural resources, jobs and markets, as if the existing violent conflicts in different parts of the world are already not enough! The emergent global consensus on sustainable development and climate change is encouraging but it should not make any one complacent. This consensus has emerged due to extensive scientific work done by both natural and social scientists with the help of progressive governments in many parts of the world. The advocacy work done by civil society organizationsin the above regard has also been critical. But, there are large population groups in almost every country that can be mobilized by populist politicians to prop up or establish highly divisive nationalist regimes advocating simplistic solutions to complex issues. When such solutions do not work, disgruntled people can be easily misguided to find scape goats, either within their own countries or outside them. Unfortunately, the levels of sophistication of public discourse or the quality of public education in many countries have been too low to create a well- informed public capable of seeing through the rhetoric of populist politicians who seek power at any cost. 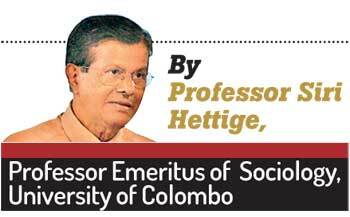 Sri Lanka´s experience over the last few decades clearly attests to the above fact. "As is well known, Sri Lanka´s current political situation is volatile and the country is faced with an uncertain future"
As is well known, Sri Lanka´s current political situation is volatile and the country is faced with an uncertain future. The term of office of the present government is just five years. It has only three more years left before facing elections again; a very short period to deliver tangible and significant results to convince the masses that good governance based on liberal democratic values is the way forward. But the performance of the government so far has not been fully convincing. The leaders of the government have to get their act together quickly and take some concrete measures to demonstrate that the regime is fully committed to make good on the promises made in the run up to the Presidential election in 2015.Ironically, it is the more liberal political environment that the regime created over the last two years that has made it more difficult to rein in the disruptive nationalist forces and implement development projects. Given the precarious macro-economic situation exemplified by mounting foreign and domestic debts, widening trade gap, etc., short term measures are necessary to tide over the situation, but a long term perspective and the establishment of effective institutions to facilitate evidence-based policy making are also critically important. It is only with such an institutional set up that we could make sustained progress on the three biggest challenges we are confronted with, namely, creating national unity, reducing income inequality and sustainable development. The author is currently based at the South Asia Institute, Heidelberg University, Germany where he holds the Sri Lanka Chair.